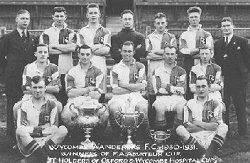 Wycombe Wanderers Football Club have a long and fascinating history right up to the present day. Formed in 1887 by a group of young enthusiasts, the Club progressed to become a leading Amateur side before setting the semi-professional scene alight in the early 1990's. In 1993 Wycombe became the first and so far the only team from Buckinghamshire to play in the Football League. Another massive landmark was achieved in the 2000/2001 when The Wanderers reached the Semi-Final of the FA Cup.